URGENT ALERT: We have been told there are other sites on the internet who seem to be fraudulently asking for donations for the 14 young wild horses (WY14) Protect Mustangs rescued from the slaughterhouse. We believe more than 100K people have been directed to donate to the wrong website . . . and as a result, the WY14 are being scammed. We noticed donations for the WY14 decrease dramatically after their first 45 days in California. As of August 17, the WY14 moved from a layover ranch north of Reno to another ranch in northern California. Protect Mustangs has always paid for their hay, vet and their other costs made possible by donations. The previous ranch was authorized to have a GoFundMe to pay for $600. a month board for 2 months, then we paid for their board until we moved them out. We are sure that the ranch where they reside now is honorable and not asking for donations for the WY14. How can some people scam on these young innocent orphans who lost their place in the world, their freedom, and lost their families to slaughter? 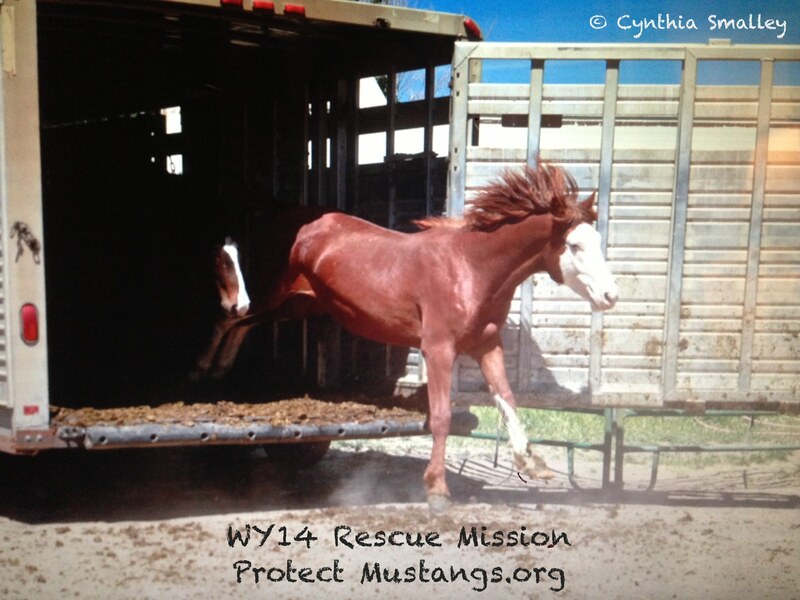 Because of a severe drop in donations, the WY14 desperately need hay donations right now! Hay prices have skyrocketed. . . All the money previously raised for their hay costs since their arrival from the slaughterhouse feedlot May 26th has been spent on hay with nothing left. We hope you will understand that we need to wait to print and mail out thank you gifts because first the WY14 needs to eat. We will get thank you gifts out when we have stabilized their hay situation. Protect Mustangs is a California non profit organization and is in the process of getting a 501c3. Your donations directly to us should be retroactive. Meanwhile we are sponsored by the Andean Tapir Fund to ensure 501c3 tax-deductible status. We receive ONLY the funds we raise for the WY14. You can help the 14 WILD ones by donating to help buy hay on our website www.ProtectMustangs.org via www.PayPal.com to Contact@ProtectMustangs.org , sending a check in the mail to Protect Mustangs, PO Box 5661, Berkeley, Ca. 94705 or by going to this fund-rasing link http://www.gofundme.com/9xcfag . GoFundMe takes a % to use their service. 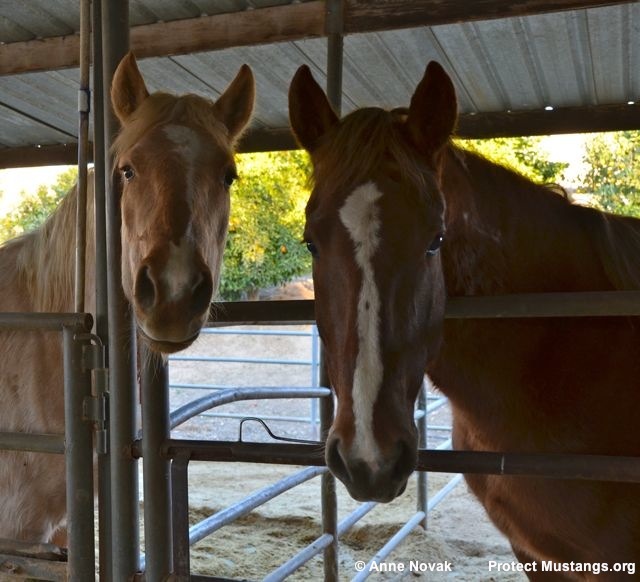 These are the only secure ways to donate to feed and help these traumatized young wild horses. The WY14 are so grateful for your TAX-DEDUCTIBLE donations to buy hay so they can eat and heal from the trauma of the roundup where they lost their families to slaughter. Please help with a donation today. The WY14 know you care and they are grateful you are helping to feed them. 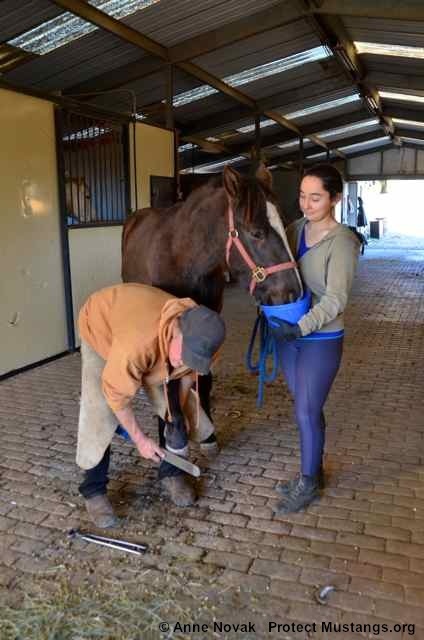 Thanks to donations for the Outreach Mustangs, Tibet was able to get his feet trimmed. 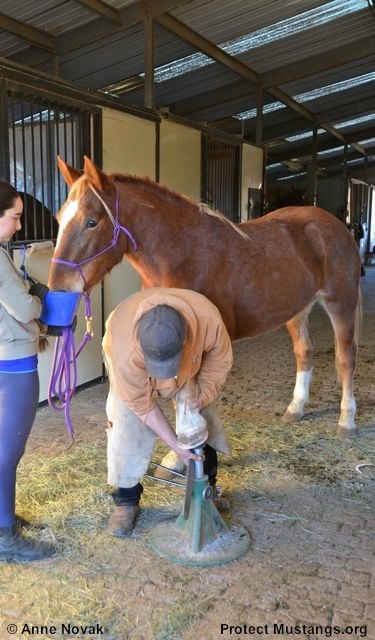 Good foot care is essential to keep a horse healthy and for youngsters to grow properly. 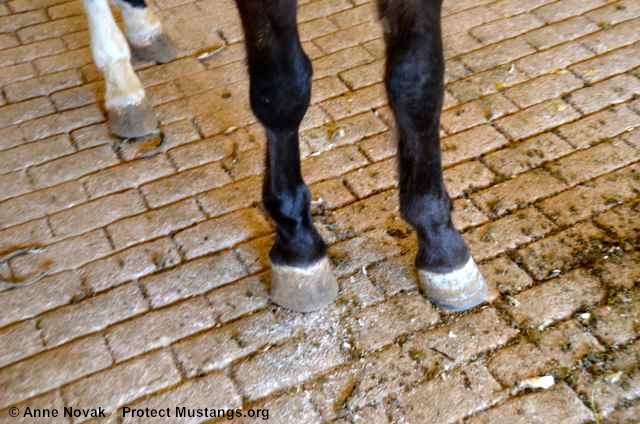 In the wild, mustangs wear their feet down but once they are living in captivity quality foot care is one of the best things you can do for them. Sadly the Bureau of Land Management neglects captive wild horses feet in the pens. 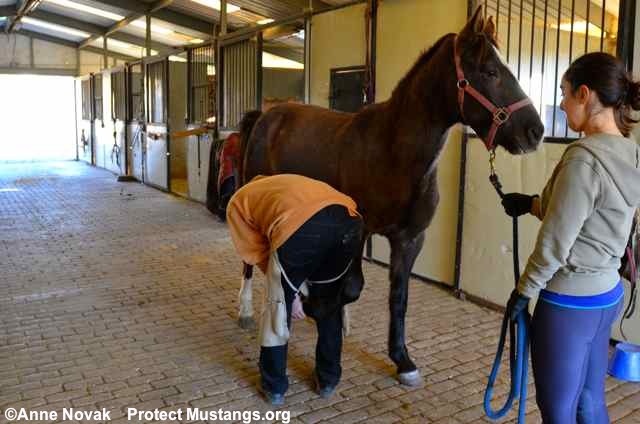 We are grateful to be able to give excellent corrective foot care to the wild horses in our Outreach Program. Every trim is always another learning experience. Today Tibet (Divide Basin, Wyoming) was trimmed for the first time in the big barn at the boarding facility with other horses around in stalls, horses walking in and out and being saddled up and hosed off. His back was facing a lot of the activity so he learned to be OK with that. Terry Johnson, one of our the farriers, is so patient with young horses and has no prejudice against wild horses. Sadly some farriers think wild horses will be difficult and refuse to work with them. Wild horses are just like green horses once they are gentled. Tibet is only 2. We saved him a year ago from facing his 3rd Strike and possibly being sold to a kill buyer for $10 in a truckload of wild horses ending up at slaughter. One hoof trimmed and 3 more to go. Then he got squirmy so I hand fed him some hay. A lot dropped on the floor. We had to keep his head up so the farrier could work on him without Tibet moving about. Tibet heard the tractor going to get the hay for dinner and he became more squirmy. The farrier suggested we give him some alfalfa pellets and boy was Tibet a happy camper! So that’s how we finished the job. Blondie was distracted by so much activity in the big barn but the grain worked wonders for her also. Such a great learning experience for Blondie too! Contact us if you would like to sponsor Val, Sol or Tibet to be a very special part of their lives and an essential force in our Outreach Program. These Ambassadors are educating many people about the plight of America’s wild horses. You may also make a one time or monthly donation for the Outreach Mustang Fund that pays for hay, board and trims. We are 100% volunteer non-profit organization with all the money going directly to the wild horses. We donate our time to care, train and engage in outreach with the wild horses in our program. Right now on Facebook we have a fundraiser for the Fund. You can donate $150 and receive a one of a kind handmade turquoise bracelet as a thank you. Here is a slide show of Blondie & Tibet during their first turnout after we gentled them.